Last month, I and Helena flew no less than 10 times. I said, TEN TIMES. Yep, you read it right. This number is the result of the combination of our unexpected flight to Vancouver and our much expected trip to Brazil. I believe I experienced every possible scenario one can experience flying with a toddler. Let me tell ya, it wasn’t easy. There were things I wish I had known ahead of time, and this is why I am here now. If you are going to fly with your little one any time soon, I truly hope this post can be of some help to you! I wish flying to Vancouver had not been so easy. It gave me this false impression that flying with Helena was always going to be that smooth. Lesson number 1: each flight is one of a kind. On our way to Vancouver, the plane was almost empty. There were lots of spare seats, and so, Helena and I had three seats to ourselves. I sat on the aisle, and Helena had two seats all to herself. I had brought lots of toys and snacks with me to keep her busy and happy. Snacks were really important to get Helena to keep on chewing during take-off and landing in order to keep her from crying due to discomfort in her ears. That was a smooth, quick flight. Truthfully, our return flight should have, probably, been even easier had the flight attendant not been so “passionate” to correct my seat position. 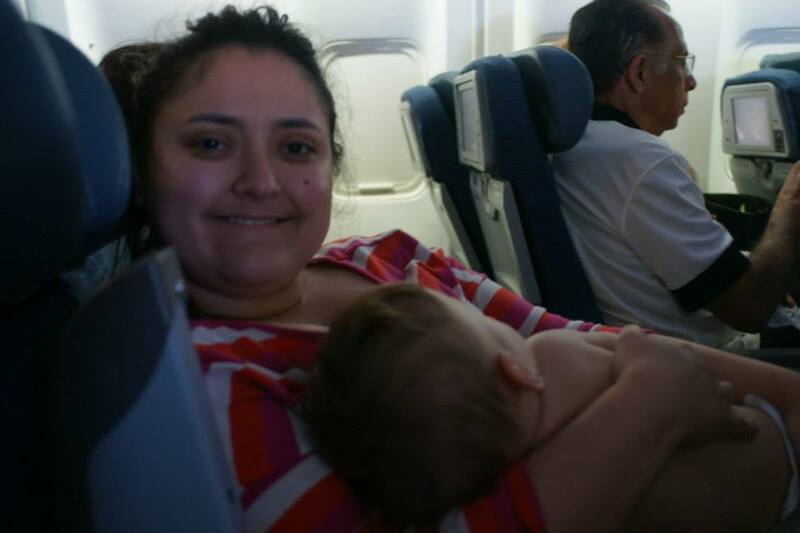 Helena had been sleeping for most of the flight, but, when we were close to landing, the flight attendant noticed that my seat was reclined. I was expecting her to simply let me know I should put it back to the upright position and allow me to do so myself, as Helena was asleep in my arms, but, instead, she pushed it up herself very abruptly. Keep in mind she is in the aisle and I am on the window… It was not smooth at all and, of course, Helena freaked out and screamed for the rest of the flight. This time, there were two people seating next to us: a really nice young lady, and an a$$h@le. The a-hole had no problem in demonstration his frustration. He pushed his fingers into his ears so deeply I thought he was about to burst his eardrums. He had this horrible facial expression as if he had just started to experience the first symptoms of food poisoning. I was so mad at him for making me feel this uncomfortable. Does he really think I was enjoying any of that? Does he not realize she was in my very arms and the screaming was so much more stereo, surround sound to me than anyone else? I asked him, but thanks to Helena’s screaming he did not hear me, if he had been born that old already. Had he never been a freaking child before? Either way, two completely different experiences flying alone with Helena. The return flight was so traumatizing I did not want to fly alone with her ever again. Scenario 2 – Flying with L.O and Hubby in three seats. You are probably thinking that must’ve been the greatest flight yet. Nope, that was not the one yet. I was amazed to find out how misleading having three seats was. I had booked two seats for us in the very last row of the plane as I wanted to make sure we were going to bother the least possible number of people on the plane if Helena was to freak out. We were on the plane for only about 5 minutes when a nice gentleman offered to switch seats with us. He was in the middle row, which has three seats available, all by himself and figured it would be more comfortable for us if we had the extra seat. I truly appreciated the gesture, but it turned out to be hell. It was more roomy, yes, but not “roomier” enough to get anything done. We could not find comfortable positions and Helena wanted to nurse constantly. Whenever I’d try to lie her down on the middle seat between us, she would freak out. But, eventually, we had a decent flight. We did fly when we were in Brazil, but they were shorter flights, easier to handle. The best flight yet though … Well, that one story and a list of tips for flying with LO. Well, that one is coming up on my next post! I really got to get to bed now! Can you tell I was exhausted?